Carbone Costa Rica presents its line of welding machines, MMA and all its accessories in Costa Rica. It merges electrodes such as 6010, 6011, 6013 and 7018. MMA includes self-regulated control of the arc force and anti-sticking technology electrode. It allows welding MMA arcs and Lift TIG. Not only they are versatile machines, but have the industry requirements, delivering TIG power and 200 Amps of MMA. Our line of machines allows welding all types of steels, plus bronze and copper. 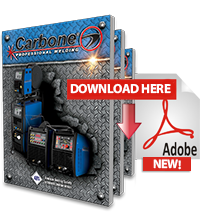 Carbone Costa Rica introduces the new line of welding machines in its catalog, where you can meet the widest range of machines for MMA welding. We offer a variety of machines with various regulations and features to perform any work that you need.